Born on 27 June 1865 to parents of Prussian-Jewish origin. Educated at prestigious Scotch College and graduated an engineer from Melbourne University in 1893 and arts/law in 1895. Worked as an engineer and joined the Garrison Artillery (Army Reserve). By 1913 he was a colonel and had published 100 Hints for Company Commanders - later an army training manual. Sent with the 4th Brigade (1,000 men) to Gallipoli in 1915 where he made a name for himself for his independent decisions in a bungled campaign. But even he could not save his brigade from the futile August/September offensives against the Turks in that year. By June 1916 he was in France, with the rank of major-general and in charge of the new 3rd Division which he trained mercilessly. Once again he used raiding techniques frowned on by the British High Command, but they were impressed by his detail and precision in a war that was going very badly. By 1917 he was made corps commander. He trained his troops to a high degree of efficiency and coordinated the use of infantry, air-power, artillery and tanks. It was at the Battle of Hamel Hill on 4-July-1918 that his tactics won a well needed victory for the Allies. 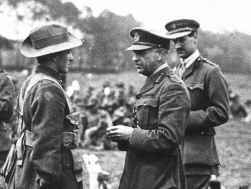 On 12-Aug-1918, Monash was knighted on the field by King George V. Thereafter the A.I.F. smashed its way through France, used as shock troops in an amazing series of victories against the Germans - at Chignes, Mont St Quentin, Peronne and Hargicourt and breaking the Hindenburg Line. None of the generals at the time compared with him in intellect, personal magnetism, management and ingenuity. However, he was often reminded that he was a Jewish colonel with no formal army background by many members of the British High Command. He won the respect and loyalty of his troops.
" It was all over on ninety-three minutes - the perfection of teamwork"
on the Battle of Hamel on 4 July 1917. "Feed the troops on victory"
Sir John's method to end the slaughter and the tragedy.